The hunt for the ideal hot cross bun continues. I still miss my favourites from Davelle’s bakery in Epping, but I’ve moved house so it’s too far even for me to make the trip just for buns! 1. I added 2 teaspoons of home ground mixed spice which I had on hand and added it to the flour. 2. I soaked 1 1/2 cups of dried fruit (currants, sultanas and a little mixed peel). 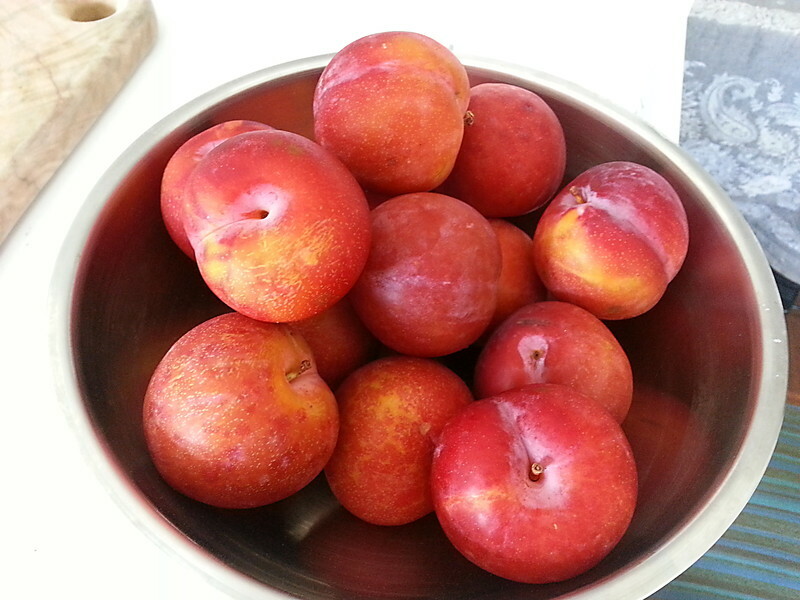 It’s important to soak your fruit or it’ll make the buns dry as they soak up any liquid in the dough. Cover with boiling water and soak for a few hours or soak in cold water overnight. Drain. N.B. As an alternative you could use cranberries or use choc chips. 1. Add yeast to warm water to make sure it’s still active (it should start to froth up in 5-10 minutes). Add flour mix and spice to an electric mixer bowl with the paddle attachment, add the yeast liquid and mix on low speed until a dough forms. Swap to the dough hook and knead on medium speed for 8 minutes or until a small piece of dough stretched out forms a thin layer and doesn’t just break apart. This let’s you know the gluten has started to develop and this gives the bread its structure. 2. Transfer dough to an oiled bowl, turn over in the oil and cover with oiled clingwrap. Place in fridge for 6 hours (or as long as you have, overnight would be fine). This retards the growth and develops flavour. The dough almost doubled in volume. 3. Dust a chopping board with flour, remove dough from bowl and press out into an oblong like an A4 sheet of paper in portait. Lay drained soaked fruit on top and press in gently (it won’t go in much that’s ok). Roll up towards you starting at the furthest edge making small firm pressing turns to help enclose the fruit within the dough. Once rolled up, turn the log seam-side up and press out gently as before into portrait. Repeat the rolling again until the dough starts to stretch over the fruit and some of the fruit starts to pop out. Return dough to oiled bowl, cover and leave to rest for 10 minutes. 4. Cut dough into 8 pieces (this made quite large buns, you could easily make 10-12 buns) and shape into balls. Use flour as this is a bit messy. Try to enclose the fruit within the dough. Place buns on a baking paper lined tray with a little space between them as they will expand. Place tray inside a large clean plastic bag (like a small clean garbage bag), trap some air in there so the plastic doesn’t touch the buns and tuck ends under or tie up. Place on the stove top or another warm place. Place a pizza stone on the bottom level of the oven and preheat to 250C fan forced. 5. For the next 45 mins to 1 hour let buns double in volume inside the bag and oven should get really hot. 6. Remove tray of buns from bag and place in oven on the pizza stone, close door quickly. Reduce oven temperature to 200C fan forced. Quickly open the oven door and throw one cup of ice or 1/2 cup water onto the bottom of the oven underneath the tray of buns and quickly close the door. This creates steam in the oven which produces a nice crust and browning. Bake for 15-20 minutes until deeply golden. 7. While buns are baking make a glaze with 2 tablespoons white sugar, 1/3 cup water and a pinch of cinnamon. Bring to the boil in a saucepan, stir until sugar is dissolved then simmer for 5 minutes until slightly thickened. Brush warm glaze onto freshly baked buns. 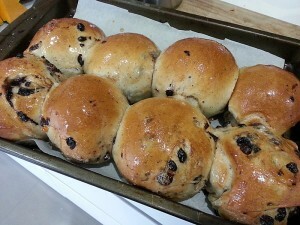 Allow buns to cool before cutting. They will be a little doughy straight out of the oven but are fine after cooling. 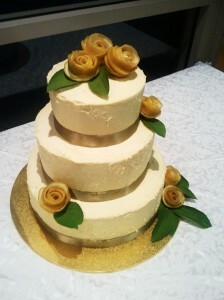 I have become obsessed with this cake, after testing it for the CWA challenge at work. 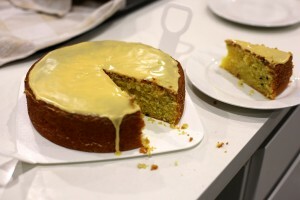 It is a delicious and moist cake with the refreshing flavour of passionfruit to lighten it up. I have made a few changes to make it my own as the original had a tendency to crack. I bake mine at a lower temperature for longer which helps it not to crack as much, it still cracks a little, but settles back to almost flat with just a gentle dome. I’ve also cut the raising agent by replacing some of the self raising flour with plain flour. Pre heat oven to 160C conventional. Grease a 20cm aluminium round cake pan with softened butter, line the base with a round of greased baking paper. Dust base and sides lightly with flour and firmly tap out any excess flour. Beat butter and sugar in the bowl of an electric mixer with a scraper paddle until light and fluffy, this can take 5-8 minutes. Beat in egg yolks, one at a time until combined. Add passionfruit pulp to buttermilk, combine sifted flours in a bowl. On low speed, add buttermilk and flour alternately to mixer bowl until just combined. Beat egg whites with a whisk until soft peaks form. Fold into cake mixture with a large kitchen spoon or spatula in two batches. Spread mixture into prepared pan, level the top and tap firmly on the bench. Bake in oven for 1 hour to 1 hour 20 or until cooked in the centre and golden on top. Stand for 5-10 minutes before turning onto a clean tea towel on a baking tray. Remove baking paper from base of cake if it has come out of the tin. Leave upside down to cool for 10 minutes if you want a flattish top. To invert, place a serving plate or baking tray on the cake and use the baking tray to support the cake. Hold together and carefully flip so the serving plate is on the bottom. 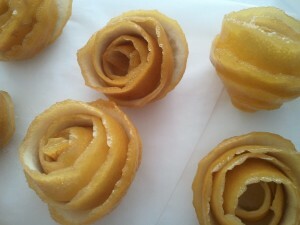 For passionfruit icing, stir icing sugar, milk and enough passion fruit pulp to form a thick icing. Keep bowl of icing covered with cling wrap until ready to use so it doesn’t form a skin. Once cake has cooled, ice top with passionfruit icing. You can ice while warm but the icing will run down the sides of the cake. 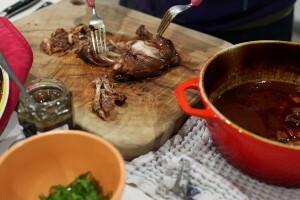 This roast lamb shoulder was so delicious and easy. Buy a deboned lamb shoulder, open it out and spread the inside with chopped capers, dijon, anchovies, lemon, olive oil, garlic and parsley, roll it up, tie with string. Roast at 230C for 30 minutes until golden and crispy then reduce heat to 160C for 30 minutes per kilo. Rest for at least 15-20 minutes. 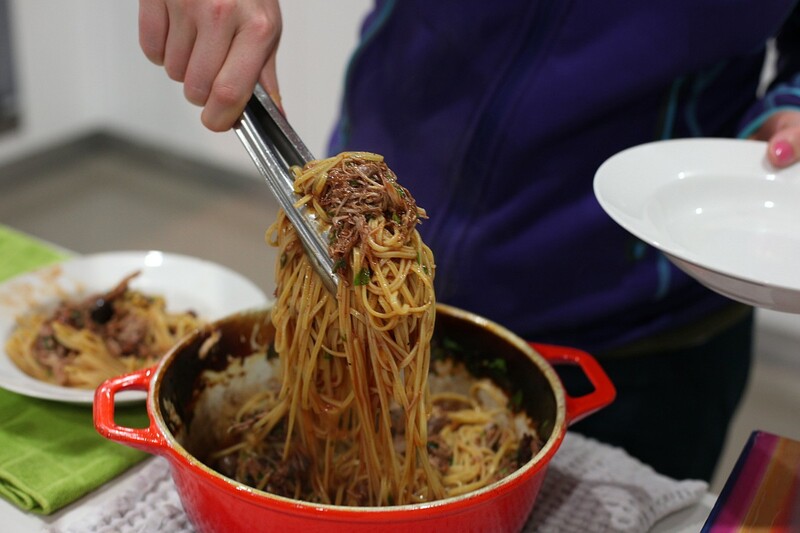 Recipe from Hugh Fearnley Whittingstall’s River Cottage Meat book. We had a stunning eggplant and pomegranate salad (recipe from Plenty by Yotam Ottolenghi) which went perfectly with the lamb. Place eggplant over bbq or gas flame until charred, drain over colander, scrape flesh and mix with tahini, lemon, garlic, pomegranate molasses, parsley and a little water. 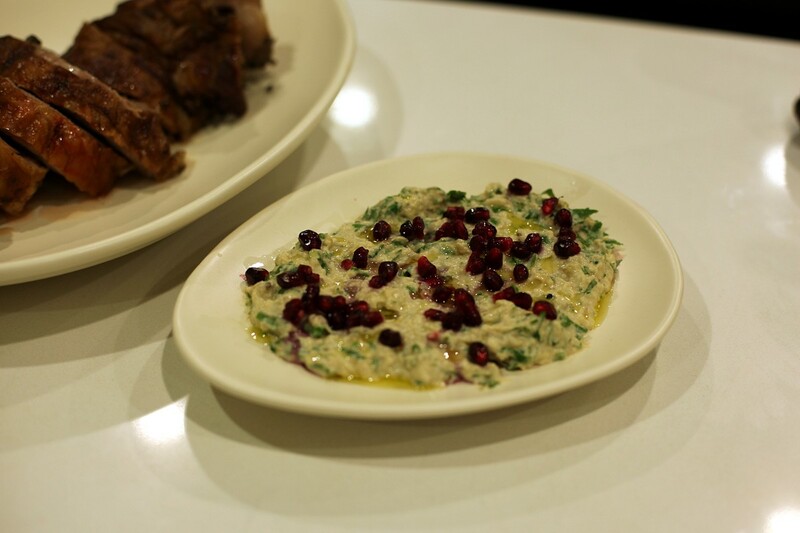 Top with fresh pomegranate seeds. My favourite comfort food – rabbit and pasta. The ragu is from Stephanie Alexander, it’s her ‘hare pasta sauce’ but made with rabbit. The pasta is saffron linguine from Marrickville markets. Parsley, thyme and bay from the garden. The wine to deglaze the pan and relax the chef is a McLeish Estate cabernet sauvignon/merlot. I went to an ethical foie gras dinner a few years ago when a colleague of mine couldn’t go. Edouard de Souza’s ethical foie gras was delicious, although it seemed to me to be a completely different product, more meaty and livery, and less buttery. Anyway, listen to what Dan has to say, I think you’ll enjoy it. This morning I read the article by Peter Meehan called ‘The art of toilet cleanliness according to Joe Beef’ about what it’s really like being a chef. I laughed pretty hard. It reminded me of plenty of chefs I know, and some of the stories they’ve entertained me with along the way. I love my job, and magazines like this that celebrate our industry and the real inside goings-on. Reading Lucky Peach is therapy, good for the soul. 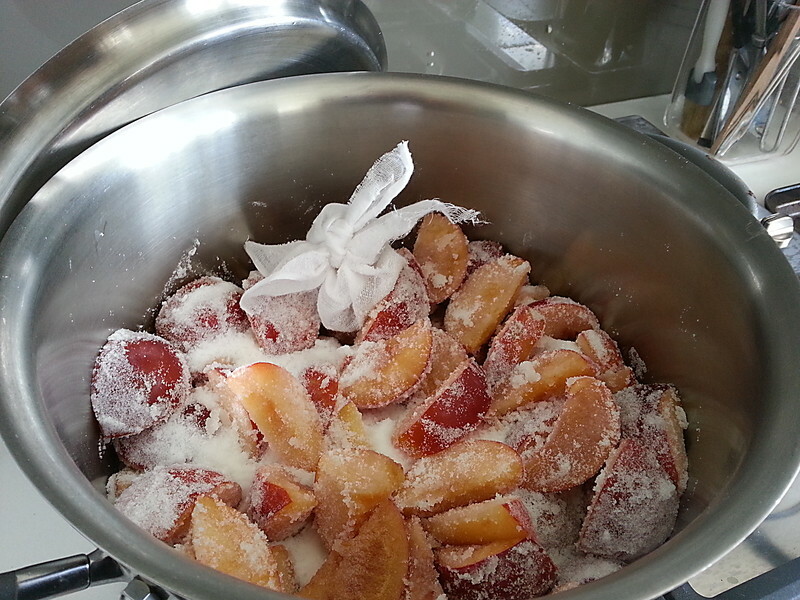 Pipe the mixture onto baking trays and allow to ‘skin’ or set for 15 minutes to half an hour. 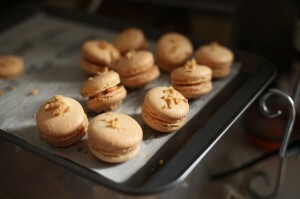 Bake at 160-170C fan forced for about 12 minutes until golden and the macarons release from the tray when lifted with a palette knife. Allow to cool completely before moving. 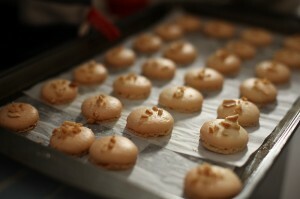 Fill with peanut and salted dulce de leche (caramel) filling and sandwich macarons together. Allow to set for a few hours. Kitchen by Mike is my newest food haunt and I love it. I’ve been taking everyone I can possibly grab as well, so have now been for weekday breakfast and lunch, weekend brunch, but not dinner. The food: There’s no menu, just go up to the food counter and see what’s on. There’s always good bread, and I mean open crumb, moist, crusty sourdough with pepe saya butter. Usually a few interesting salads and some grilled or roast vegetables. A simple pizza with a delicious crust and quiche or tart, pastries and a cake or two for dessert. Everything is served room temperature and they just keep replenishing the food during service. 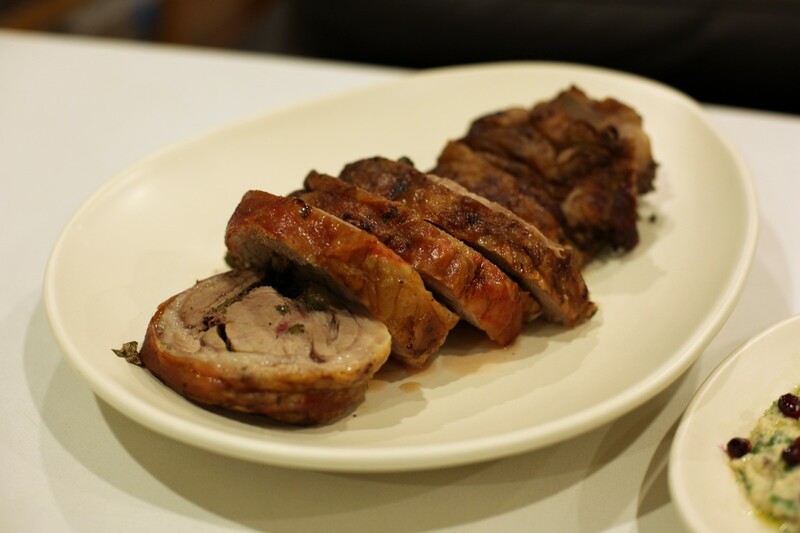 It reminds me of Ottolenghi in London. Lunch is reasonable and normally works out to about $15 per person, depending on what you get. The plate above has a globe artichoke, a luxury I learnt to appreciate from my stepmother. You peel off the layers one by one, dip them into the homemade mayonnaise and scrape the flesh between your teeth. When you finally get to the heart you discard the furry choke and eat the tender heart and stalk. 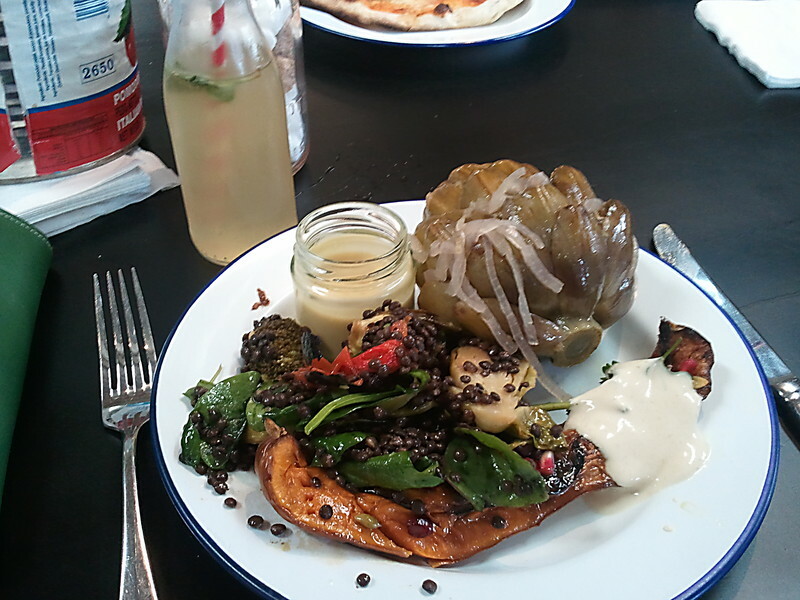 Also on the plate, a lentil and brussels sprouts salad, a deeply caramelised roast pumpkin wedge with spiced yoghurt. I’ve also tried a wonderful mushroom soup, roast chicken, margherita pizza and coleslaw. 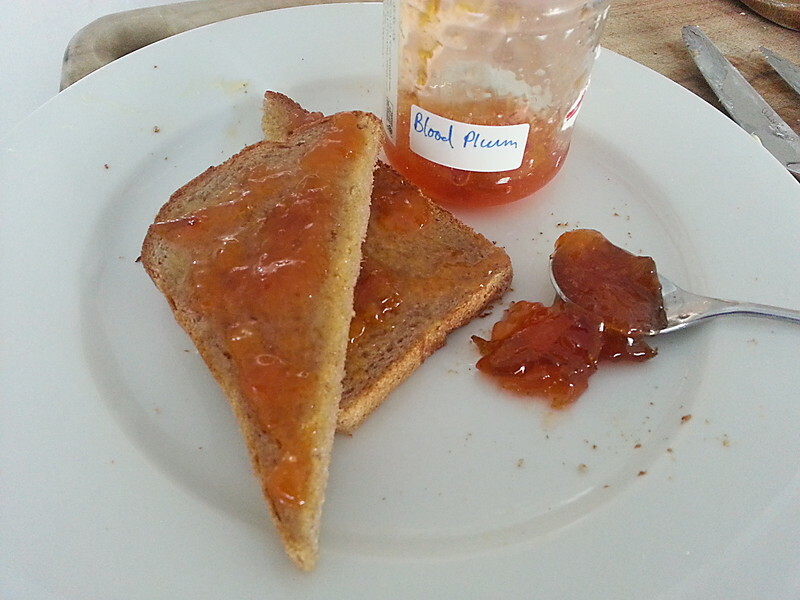 For breakfast I’ve had a bacon buttie and toast with jam, my friends have had the sourdough pancakes with lemon curd, the Boston baked beans with poached eggs and the bircher muesli, all of which are good. 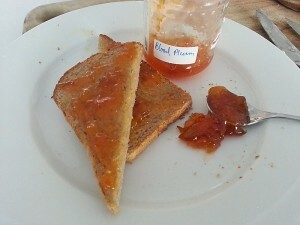 There is a limited menu for weekday breakfast; toasted muesli and yoghurt, Bircher, toast with jam and porridge. The weekend breakfast is where they have the most options. The space: is a canteen in a warehouse space, so as it’s getting chillier, bring something warm to wear. A colleague who came here first told me to leave time to walk around the homewares section before you eat, so that you’re not so distracted by the pretty things and end up ignoring your dinner date. The coffee: is fantastic. I’m surrounded by Campos and Allpress, Sonoma and Bourke St Bakery all of whom do good coffee so this is stiff competition people! They also have smoothies, fresh juice, iced tea and homemade lemonade that come in cute glass bottles with barber striped paper straws. If you just want coffee and a pastry don’t line up in the big line, just go to the coffee counter and save yourself some time. There was such a delicious feast at Iain and Jules’ engagement party that we didn’t get through all of the cake, what a shame, we had to divvy the rest up to scoff at home. Jules, I need recipes for the adobo pork and chicken, and the vermicelli noodles, yum! 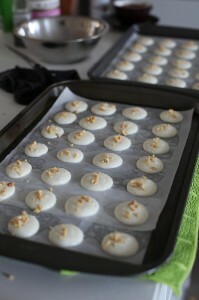 This recipe is from Rose Levy Beranbaum’s amazing book, ‘Rose’s Heavenly Cakes’. I picked up so many great tips from her perfectly tested and detailed recipes. Everyone loved the lemon peel roses. One small person was heard asking ‘can you eat them?’. Cute. Of course you could, but mine were a little on the firm side. Next time I would try to take a little less white pith with them as I peeled them as I think they were a little stiff. Entries (RSS) and Comments (RSS). 47 queries. 0.369 seconds.